PRESS RELEASE: The Phil Rudd Special Edition Drum Set features a 22" X 18" no mount Bass Drum, a 13" X 121/2" Tom Tom, an 18" X 171/2" Floor Tom, and a 16" X 171/2" Floor Tom in a gloss black finish. Hardware is also included, (bass drum pedal, two mini-boom stands, a single tom stand and hi hat). The kit retails for $1,659 and has a MAP price of $999. Phil's philosophy on drum sound is pretty simple, "I have always preferred the big, powerful sound of large toms and floor toms". This new set certainly delivers on that philosophy! "This drumset was designed to achieve the fat, punchy sound Phil prefers and will be an excellent choice for rock players all over the world to create that sound" said Larry Nelson, Product Manager for Sonor USA. Australian native Phil Rudd is one of the most important drummers in the history of rock music and his drumming has influenced drummers all over the world. His playing is an essential part of the AC/DC sound. AC/DC is without a doubt one of the most important, influential and successful rock bands of all time. Since forming in 1973, AC/DC's high voltage rock 'n' roll has sold‐out concert tours with sales of more than 200 million albums and counting. 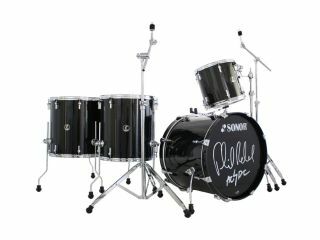 The Phil Rudd Special Edition Drum Set will be available at all authorized Sonor dealers starting Fall 2009. For more information on AC/DC go to: www.acdcrocks.com - also check out the SONOR homepage: www.sonor.com.